Town of Big Piney Sled The Town of Big Piney’s banner hangs on a sled. Photo by Cat Urbigkit. John Wood team lines up Alaska musher John Wood’s team lines up to start the Piney to Alpine stage of the race. Photo by Cat Urbigkit. Doggie Fashion Show Jenny Beiermann shows off her dog during the "Doggie Fashion Show" at the Meet the Musher Banquet for the Big Piney-Marbleton stage of the IPSSSDR. The International Pedigree Stage Stop Sled Dog Race began in 1993 with the goal to introduce spectators to the sport of sled dog racing, spread the word about the need to immunize children under the age of two years old and to showcase the beautiful state of Wyoming. In 2007, Big Piney and Marbleton joined the event to become one of the host towns and a new stage stop for the IPSSSDR, bringing the total to 11 towns participating. Other towns include Jackson, Lander, Pinedale, Alpine, Kemmerer/Diamondville, Evanston, Mountain View and Lyman, before concluding in Park City, Utah. The race has a unique "stage stop" format, similar to the Tour De France bicycle race, with each day bringing a new contest. The best accumulated time determines the overall winner. Twenty sled dog teams were entered in the race, coming from Wyoming, Montana, Michigan, California, Alaska, Minnesota, Utah, Colorado and Canada. Big Piney hosted a "Meet the Musher" Banquet at the Marbleton Senior Center on Monday night with a potluck/Dutch Oven supper. Guests were asked to bring a salad or dessert to share. Later, the audience was treated to a delightful Doggie Fashion Show. Jackson band, Global Review, played live music. Commemorative t-shirts, hats and CDs were on sale. The Big Piney-Marbleton stage took off from the Middle Piney snowmobile parking lot on Tuesday morning at 9 am with teams racing approximately 64 miles to Alpine for the next stage. Photos by Cat Urbigkit and Dawn Ballou, Pinedale Online! Excited dogs Musher Kate St. Onge’s dogs jump and lunge and are impatient to get started. Photo by Cat Urbigkit. Reserve dog Backup dogs travel in each musher’s own truck kennels. Photo by Cat Urbigkit. Big Piney Start Mushers and race watchers gather at the Middle Piney parking lot Tuesday morning for the start of the next leg of the race. Photo by Cat Urbigkit. Portable Kennels Dogs travel in portable kennels between segments of the race. Photo by Cat Urbigkit. Snowy Big Piney Start A gentle snow continued to fall as crews prepared for the race start. Photo by Cat Urbigkit. Bob Beiermann helps Big Piney veterinarian and Marbleton Town Councilman Bob Beiermann helps the teams get set for the race start. Photo by Cat Urbigkit. Excited dogs As the teams line up to begin, the dogs are vocal, howling, yowling and barking. Photo by Cat Urbigkit. Wesley Rau start Wesley Rau’s team leaving the start. The racers’ feet seem to only occasionally touch the ground. Photo by Cat Urbigkit. On their way Dogs begin the run into the Wyoming Range. Photo by Cat Urbigkit. Long Food Line The food line wrapped around the entire room at the "Meet the Musher Banquet" at the Marbleton Senior Center on Monday night for the Big Piney-Marbleton stage stop. Dutch Oven Delights Food at the banquet included Dutch Oven-cooked ham, potatoes and baked beans that were absolutely delicious! Frank Teasley Race Director IPSSSDR Race Director, Frank Teasley, introduces Jackson band, Global Review, and gives announcements during the Big Piney-Marbleton Musher Banquet. Bob Beiermann Bob Beiermann was one of the organizers for the new Big Piney-Marbleton Stage Stop of the IPSSSDR. 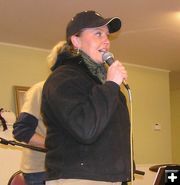 Carie Whitman Carie Whiteman organized the Doggie Fashion Show for the Big Piney-Marbleton IPSSSDR stage stop entertainment at the banquet. Global Review band Jackson band, Global Review, played at the Meet the Musher Banquet at the Marbleton Senior Center on Monday night.